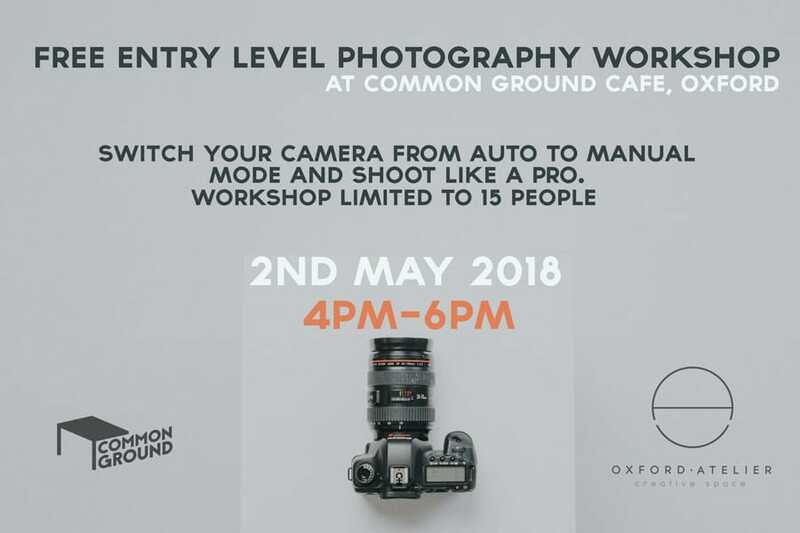 Together with Common Ground Workspace we are delighted to be running our free photography workshop on Wednesday 2nd May 2018. Maciek from Oxford Atelier will introduce you on how to move away from the auto settings of your DSLR. The workshop will introduce you to aperture settings, ISO and shutter speed and how to manage them to take your photos to a new level. It will cover how to understand focal lengths and an introduction to the types of lenses available e.g. prime and zoom lenses. The evening will be a 2 hour workshop with lot’s of opportunities for questions. Our aim is that you will leave the evening armed with practical pointers that you can take away and practice to see improvements in your photography. The workshop is suitable for both absolute beginners and for those who are a little rusty and would like a recap on the fundamentals. Just come along on the evening at common grounds cafe with your DSLR. Pre-booking is essential. Select the free event on the calendar and make a booking. If it’s not clear enough we’re here to help.